Yep, I understand. 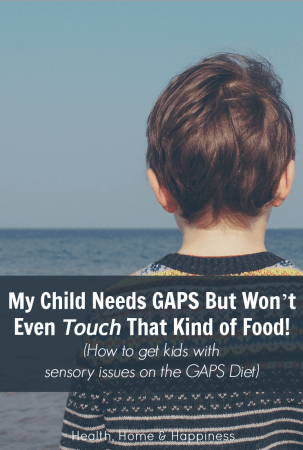 Many “GAPS Kids” or as I refer to them while talking with other parents who have special needs children, ‘our kids,’ have very strong likes and dislikes with food, and we can already feel like we’re battling to get them to eat our favorites. 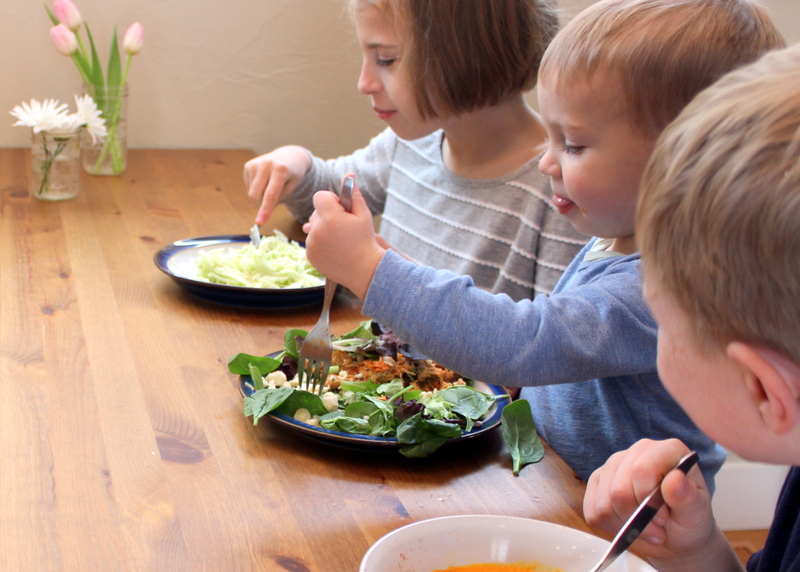 I just wrote a post about how I get my kids to eat– and this works well for our family now, after years of the GAPS (Gut and Psychology Syndrome) diet and years of understanding her quirks and what wording or situations encourage or discourage her to eat healthy food. 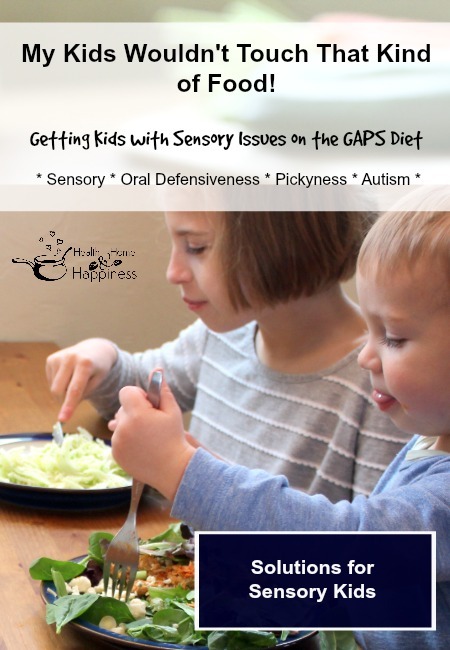 So, how do I introduce the GAPS Diet with my special needs child? I’m a mom, not a medical professional, before changing your child’s diet you should run it by qualified professionals. After you’ve done that, I recommend slowly removing things from their diet. We were already dairy free when my little one was 2-1/2, so we next took out gluten. There are lots of child friendly gluten free casein free foods on the market now, so you most likely can find gluten free alternatives to what your child currently is eating. Going gluten free can cause a healing crisis, so allow your child to become completely comfortable gluten free before pushing it any more. Try different GAPS foods and see if any of them are enjoyed by your child, and gradually increase those as you can, while continuing the GFCF. See my GAPS Recipes page for ideas. Introduce probiotic containing foods like homemade sauerkraut and probiotic supplements if desired. These also can trigger healing crises so watch carefully. And then finally try the GAPS Introduction diet. The Intro diet is so so healing and helpful, but jumping right in is a big change for many kids. Desperate parents have tried jumping to Intro right away, and saw great benefits for it, but if you can try a more gradual approach, this is what we did and I feel it worked well. The previous steps took us about 10 weeks, so it’s not too too long, and we saw results with every step. Wouldn’t it work to just not give in? Nope. You can’t just put a plate of GAPS food in front of a child that has previously only eaten a very limited range of foods and expect them to finally give up and just eat it, it’s not a discipline issue, it’s a sensory issue. This advice might have worked for well meaning grandparents with typically developing children, but with GAPS kids this is a sensory issue – and they literally will starve themselves to the point of harm rather than eat a food they don’t find suitable. 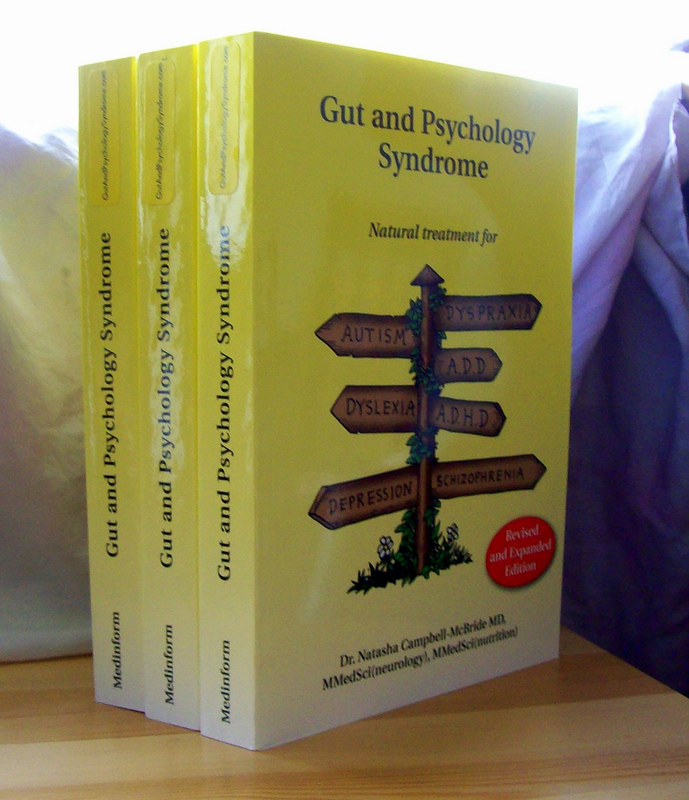 In the gut-brain connection post we talked about how bad gut flora can give off toxins that affect our brains like drugs. That’s what this sensitivity to textures and tastes is all about, in the same way our body tells us to avoid bitter foods because they likely are poisonous our kids with sensory issues are being ‘told’ that this food is not good to eat. That’s what makes picky eaters when it comes to sensory issues. The good thing about it being a gut flora issue is that it’s generally easily corrected! After just a week on the GAPS diet, or even gluten free, many kids are eating many more foods. I commonly get emails from parents that tell me that after a week on GAPS their 4 year old is happily eating tons of squash, soup, meat, and eggs- all foods that had been disliked in the past. For the 3-7 days that you’re starting the diet, I wouldn’t worry about anything other than only limiting your child to GAPS approved foods. Even if they will only eat apple sauce for days, this often starves out enough of the bad gut flora that they can then tolerate more GAPS foods. Your job during this time is to make sure they’re not getting any cheats at all- even a crumb of bread or couple grains of rice at this stage will feed the bad gut flora and prevent them from dying off, and all your hard work will be negated. Watch for sugar or additives in supplements, and get different versions if they have offending ingredients. GAPS, especially in the beginning, isn’t something you can do 80% or even 99%, it requires 100% adherence to be successful. After the gut has healed quite a bit (this was after about a year for us) occasional cheats won’t mess the GAPS person up so much, but at the beginning it’s mandatory to be strict. Even though starting GAPS will help considerably with eating new foods, parenting techniques can still help our children eat healthily. My little one has a combination of being easily overstimulated visually (lights, colors, movement), and under-stimulated with sound and touch/pressure. If any of these are out of balance, or if she’s overly hungry or tired she has a harder time focusing on eating, and this being hungry can just add to her being overwhelmed and inability to focus on eating. To break the cycle if we get into it, I will do anything I can to get her to eat a few bites of food. Usually once she’s eaten a few bites she sees how good that feels, and will continue eating. To get the first few bites in, I often sit her on my lap (still! She’s 6! ), put one arm behind my back, hold the other hand, and put a bite of whatever she’s most likely to eat from my plate in her mouth. Another thing that works for her is to make a silly, loud, energetic game with it. Yes, I’ll still do the ‘airplane’ game with buzzing the fork around in the air, she enjoys it, I enjoy it, and it’s meeting her developmentally where she is at that moment. Some parents have reported success letting kids do their favorite activity, and building taking a bite of food into it as a game. For example, the child might love stairs, so encourage them to walk up 3 stairs, and then in a happy encouraging voice say ‘3 stairs, then a bite, here you go, then 3 more stairs!’. Opening doors is a big one for us, we have used that to get her to do what she needs to do in the past too, “Open, shut, bite! Open, shut, bite!”. When doing diet therapies, it’s really important to just get the kids to eat however we can. Once we’re a few days or weeks in, it becomes so much easier, I promise. For some children the ‘when, then’ approach works well. My daughter didn’t like that, but this is what’s described in the GAPS book and works for many parents. The diet is started by allowing one bite of favored food (any food, even non GAPS food) after a bite of GAPS food (soup, meat, etc) is eaten. This way the child gets used to the taste of the GAPS food, and slowly is weaned off the favored foods. When we have toddlers with special needs, it looks like it might be easier to wait and start when the children can talk and reason. I personally advocate you start as soon as possible. When we started I could easily prevent my child from accessing foods that weren’t on the diet by putting them high in the pantry, putting a latch on the fridge, or just not having them available in the house. The older kids get, the more independent they are and the more access they have to illegal foods, and during the start of GAPS when the bad gut flora are dying off and sending chemicals to the brain that says you need bread, sugar, and grains, it’s really hard to have that much self control as an adult, much less a child. Set a time period, a start date, and go! When we started GAPS, I decided to start Nov 1, 2009, and we would try it for 30 days. That gave me the motivation to give it a good try. We obviously found it worth it to continue the diet, but getting through the first week was the hardest. 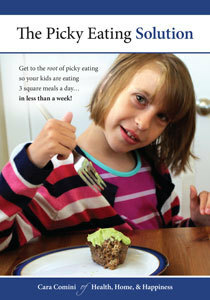 If you have any other questions about getting a picky eater to start GAPS, please ask below! My child will eat boiled hamburger. How long do you think I can keep him on that before worrying that he’s not eating anything else? I’d think it would be okay for a week or so, my son ate mostly just meat for a few months when he was 2. If you have a food processor its pretty easy to hide finely chopped veggies in the hamburger before cooking it. If you start slow you may be able to work up to quite a bit, I actually use a bit more veg than meat when I make meatballs/meatloaf and it still holds together fine. Excellent- thanks Cara. I need this for my 5 yo. I find that letting her color or draw while she eats works. Sometimes I’m the one that put the bites in her mouth, but she’s distracted by her artwork and doesn’t gag as much. This came at the PERFECT time for me. I’ve been trying to start GAPS with my 2 year old for about 8 months now and I keep caving to the pressure to get him to eat ANYTHING. He’s just getting over a cold and a self imposed fast for 48 hours now (he’s been nursing and drinking water). So I’m thinking now is the time to keep those bad nasties starved. Thank you, and wish me luck. I’m going to need it! What a great post! This is probably good advice for kids without major sensory issues too, making eating fun and doing what they need. Probably good advice for adults! You do things that work for you and in a reasonable time frame. Following the GAPS diet can be so much work, but it really is very rewarding. This also comes at a perfect time- I teach elementary art and have a lot of special needs students. I’ve been getting so frustrated because they need so many different strategies. But when I think of it the way you described it in this post- that they’re on a different developmental level, that words, games and excitement help, that different stimuli encourage or discourage- it gives me the focus to try again! thank you! Hi Mollie, so good to hear you found it helpful! I know you teachers have a lot on your plate, I couldn’t imagine trying to meet the needs of more than 1-2 special needs kids at a time. My main issue is that my 4yr old daughter who I think would benefit from this (she’s not autistic etc just had masses of antibiotics in the first 3 years of her life) will not take anything liquid other than water. So no soup, no juices, no sauces, no milk, no ice cream, yoghurt etc at all. And if it’s something she is unsure of or is convinced she doesn’t like we have huge anxiety attacks, crying, screaming and full on refusal to eat. If it’s something she likes she pretty much hoovers it up. But she will pick out bits she doesn’t like, I’ve tried the whole hiding things, won’t have sauces so can’t get stuff in that way either. I’ve tried getting her to cook with me too and she loves cooking the food but still won’t eat it. So I’m at a bit of a loss still. Through her texture issues we are nearly dairy free, only have butter, doesn’t have masses of grain/gluten but does have a fair bit of sugar now I’m looking at it. So we’ll definitely start cutting that down. But now I’m rambling!!! Any hints on where to start would be great!!! That’s a sensory issue, and likely would be helped by just limiting her to GAPS foods for a couple days; ie just give her what she will eat (cooked chicken? Veggies? Nuts?) and water for a few days and then try again. It’s really kind of amazing what happens in 3-5 days on GAPS. My daughter is 10 and she’s not autistic but does have major sensory issues and she mentally thinks she can’t eat the GAPS foods. We are on day 8 of the GAPS intro and out of the 8 days she has only eaten small amounts for 4 of those days. she is JUST now starting to eat small bites of food regularly but it’s still a major struggle. She hates all gaps foods. It has been so discouraging amd emotionally draining trying to help her through it and it’s breaking my heart! But, I know if I give in all will be lost. Any advice or wisdom you could share?! I find your site so helpful. Can I ask you a question. We started GAPS Mid-September for my “Gaps husband.” He HATES what we have to eat. In fact, he has lost so much weight. He feels like he is starving and never satisfied. He has bipolar disorder, so in some ways, he is emotionally like a teenager. In your educated opinion – can it get better for an adult? He has never liked squash. Will he ever like it? Will he ever willingly drink broth? lol :) I just need some encouragement I guess. I think it will get better, but I have to force myself to eat GAPS food sometimes. The food is good, my brain just told my body to eat refined carbs for so long that it’s a habit, I think. I have a friend who is similar, I think she still doesn’t like squash though. Using enough salt helps too. I agree with your tips, Cara. We also had a picky eater in the family and GAPS made all the difference. I also have a four part series on Empowering Kids on Special Diets. No matter their age, the more control and choice the kids have in what they eat, and the more support they have in making the healthiest choices, the better! My older child has been tested for allergies, and while he has strong reactions to dust, dust mites and pollen, he did not test positive for eggs. Can my kids really be allergic to eggs and it would not show up on a test? Certainly my husband did test positive for egg allergy, and for this reason I am hesitating to start my baby on egg yolk. I will be starting the GAPS diet soon per my dr.’s recommendation. My question is about my other family members, and especially my two an a half year old daughter, who is not a GAPS child. Should they eat the same as me? Is this a diet that would be good for everyone to do? What about the probiotics? So many of the foods seem like the food I grew up with, although we weren’t on any diet (just part of our culture). Also, I am not sure what GAPS diet I should start with (i have thyroid issuess)? Should I do the intro one? I am planning to buy some of your ebooks, just don’t know what to start with. Please advise. I have a 17 yr old daughter who stopped eating well when she around 2 years old. She now has serious acne issues, abdominal pains, hypoglycemia (severe shaking and feeling like she will pass out) and eats a very limited diet. She will only eat grilled or roasted chicken, steak, ground beef, cheese, almonds, pistachios, apples, bananas, ice cream, flour tortillas, rice, yogurt, raw milk, sprouted granola or LOTS OF PASTA and the only “vegies” she will eat are green beans, peas, grilled zucchini or broccoli. She has been allergic to carrots (which seems to be something pushed in the GAPS diet) since she was an infant. She likes chicken broth, but not “that yucky kind” I make homemade. She would love more than anything to “crave a salad” and not be so disgusted by so many kinds of foods and just to clear up her skin and feel well. Do you have any suggestions for an extremely picky teen who wants to try GAPS? Also how can I season or alter homemade broth to be more palatable to her? THANKS!! Have her adrenals and thyroid been checked? The shaking also sounds like an adrenal issue. Then again thyroid, adrenals and hypoglycemia are all intertwined AND can be connected to gut too. I’m also hoping to see someone respond here with their advice. I’m in the same boat as you. Hi Cara: really appreciate your website with great recipe ideas – I have used many. I *attempted* GAPS intro diet for my (then) 2 1/2 year old son (diagnosed ASD) last summer. It was awful… two days in, and he was refusing everything (even water) throwing up and very lethargic: I know it was die-off in the worst form, but I couldn’t commit to the strict intro diet plan. SInce then. I have taken the time to slowly introduce GAPS friendly foods (many of your recipes) with great success! I stumbled upon this post last week, and it gave me hope to at least try to put him on full GAPS foods first and go from there. I know for a fact he will eat applesauce, scrambled eggs and smoothies. Hopefully a week or two of this limited diet will open him up to other food choices. Wish me luck! I have a question, my son is 3 and he has sensory issues and he is a very picky eater. I have tried in the past to make him eat other foods than what he likes and couldn’t get him to eat. He would cry for hours and hours and would pretty much starve himself. ( I know you mentioned that in your post) So, what do I do, how do I get him to eat better??? He is 90%gluten free and 80%dairy free, but his food choices are very limited and it concerns me. I eat grain free, but he doesn’t want to eat anything I make. He does eat meat, but not always and berries and sweet potatoes, some chips made from beans and rice flour and gluten free pretzels. Eggs just here and there. Any suggestions what can I do?? Thank you so much!!!!!!! pragnienie. Aliści nie mógł odwrócić eksplozji. jakiejkolwiek w kierunku chwale ojcz. stwierdziwszy szachrajstwo, stawał się straszny. nadgarstku sznur. Nie pragnął, ażeby potwór urwała mu rękę. W samą porę. Ujmowanie stało na początku delikatn. Thank you for your website!!! I have been reading your posts and recipes, and this will be so helpful on a very lonely GAPS road. Unfortunately, my entire family needs treatment for everything from ASD and seizure activity on an EEG to celiac disease and sensory eating problems. My four year old son is my picky eater, and I read your post here on getting kids with sensory trouble to eat. Your ideas are what I had planned to do, but I was wondering if fresh pressed juices have too much sugar at the beginning for starving off bad microbes. He has been drinking half fruit and half carrot juice (store bought so far), and I have thought of adding probiotic foods to this. He does eat my homemade yogurt with honey in it. Is the honey okay? If not, we will be down to unsweetened applesauce and juice (that is GAPS legal)! He refuses all foods but Tyson chicken nuggets, PBJ sandwiches, milk, and crunchy starches. Anyway, any advice is welcome! Praise God for you! I was suggested this blog through my cousin. I’m not positive whether this put up is written via him as nobody else realize such special about my problem. You’re amazing! reading this wonderful educational article here at my home. I say to you, I definitely get irked at the same time as other people consider issues that they plainly do not recognize about. I have a nearly 3yr old with a very perticular personality prone to hysterics when something is not ‘right’. He suffers since birth from allergies to Peanuts, Eggs, and. Milk – (symptoms through my breast milk exposure!!) and also salmon (have not tried other fish). At this time, he is getting over a 2-3wk viral stomach bug and has lost nearly all his chubbiness. I’m also told by his pre-school teachers to look into OT for sensory processing help. What tips might you have for us? How do I follow the steps when I KNOW he has severe allergies to at least 2/4 of those listed? Hi, I am circling around and planning to do GAPS for myself (I have an autoimmune disease that affects my bladder and is often co morbid with gut issues called interstitial cystitis). Our 6 year old son is on the autism spectrum so I would like to include him in the healing. My husband is “healthy” eating a healthier version of SAD (organic and lots of veggies, meat, fruit- we don’t eat fast food or drink soda) and our 3 year old is typically developing. Both of our kids eat an incredible variety of healthy foods to the point that the therapists and their teachers say they have never seen a kid on the spectrum eat so much and such a variety of “healthy” foods. He thinks all sorts of vegetables, quinoa, meat and fowl from the grill and fruits are something to get excited about and had never heard of candy,pizza, fast food etc till he started school, I’m doing the best I can to strike a balance between continuing our healthy eating habits and not making him feel left out but it’s tough. That said I’m really nervous about telling him he can’t have his Annie’s organic cheddar bunnies or the fruit he loves so much- a week seems like forever to a kid. I don’t want him to think I am trying to “cure” him since I don’t present his autism to him as something that is “wrong” with him but rather as a word to describe how his brain works differently than some people’s brains -some things will be easier for you and some will be harder. I have been talking to him about my tummy troubles and that I am going to go on a special eating program to help heal me, that I think he might have some tummy issues (he has a lot of gas, mild diarrhea, and though I know it isn’t gut related he has motion sickness and throws up in the car frequently) and that it would be really awesome if he did it with me. That his support would mean so much to me. He says he will do it- but he doesn’t realize what he is signing up for. So for I have been cleaning up our diet, I’m eating 90% paleo/primal and the kids have been LOVING the food- ds1 had three helpings of the hunters stew I made tonight and talked all night about how he could eat it every day and that I am the best mom in the world for making such an amazing thing (he is a very complimentary kid and piles on the praise). But the boys haven’t had to give anything up. Ok sorry for the ramble I am just really struggling with how to make this work. Do you just have to toss all the rest of the food out? Do I make our three year old do it too- cause how sucky is it to watch him eat regular food while ds1 can’t? Ugh. You sound like you’re doing a fantastic job! I would also avoid telling him it’s to ‘fix’ the autism, a lot of kids on the spectrum have sleep issues, does he have sleep issues? you could say something like ‘to help you sleep’. Also, motion sickness is a GAPS symptom, so you could say it’s for that. I had my typically developing child do GAPS too, and it was good. We did the GAPs for 19 months with our 5 and 6 year old. We followed it pretty much to the letter. It did help our picky eater eat more widely. Unfortunately the fermented foods and probiotics seemed to make him very emotional and the kids still cannot have any form of dairy or wheat and many other foods at 8 and almost 10 yrs old. We did manage to get one child off losec but he still has reflux (if he jumps around after food or eats the wrong foods i.e. fruit and nuts together or tomatoes etc) and the other was developing arthritis throughout being on GAPs. I don’t meant to be a downer but it really isn’t the reset diet it is touted to be and there was very little support along the way. It did help however. Hi Cara! I love your blog and have been following it for quite some time. I wanted to attempt GAPS 2 years ago, but got pregnant and eating was hard. Now my little one is 20 months and a picky eater and has had troubles gaining weight and has developed eczema. I know a lot about gut food sensitivities and are thinking they are the case, also she was csection so missed out on healthy gut bacteria. We will probably start after Christmas, it will be beneficial for all of us, my hypoglycaemic and over wieght husband, me being pregnant again but not able to eat much besides dairy and bread, those gut bacteria talk very loudly to me in pregnancy. Wish us luck! What do you suggest if your son seems to be in that 1% where they still don’t start craving the good foods??? Feeling discouraged. That sounds tough! Some kids are harder than others. I’d try increasing probiotics. Also, have you pulled all dairy products? You can read about the dairy/opioid connection here.